NutriBiotic Ascorbic Acid with Bioflavonoids 16 oz. NutriBiotic® BlenderBottle® SportMixer®, White 20 oz. Grapefruit Seed Extract Liquid Concentrate 2 oz. DefensePlus 250 mg GSE, 90 Tabs. NutriBiotic Ascorbic Acid with Bioflavonoids delivers 100% pharmaceutical grade vitamin C (L-ascorbic acid), an essential nutrient, and bioflavonoids from lemon. Since vitamin C is not produced by the body, it must be replenished. Vitamin C is often found in nature accompanied by bioflavonoids, a group of water-soluble plant pigments. 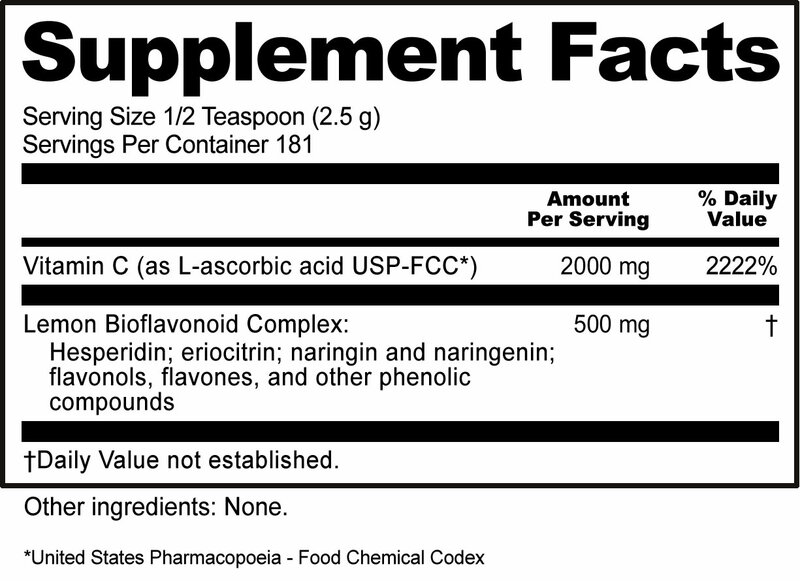 Bioflavonoids work synergistically with vitamin C to help support the body’s health. L-ascorbic acid USP-FCC* (C6H8O6) and lemon bioflavonoid complex-50 USP*. Made without Gluten and GMOs. Our Promise and Guarantee: We use only 100% pure pharmaceutical grade L-ascorbic acid USP-FCC* (C6H8O6), which contains no corn residue, plant antigens, or protein impurities. As a dietary supplement, mix 1/2 teaspoon into a glass of juice or water. Take with or without meals, or as directed by a licensed healthcare professional.